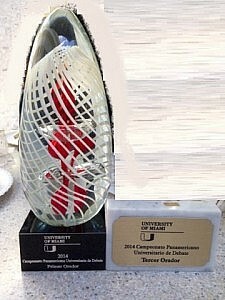 The weekend of January 25-26, 2014 marked FIU Debate history as two FIU teams competed in the bilingual Pan American University Debating Championship and took top honors, including Luis Toro’s Top Speaker award for the tournament. In addition, with teammate Emily Bello-Pardo, Toro advanced to the final round against Universidad Central de Venezuela and two teams from Universidad del Rosario, Colombia before winning second place team overall for the tournament. Joliete Re and Natalie Perez were semi-finalists in Spanish and Emily Bello-Pardo also won Third Best Speaker. In addition to the experience of debate competition, FIU students also had the honor of meeting Mr. Alfred Snider, who is often referred to as the father of international debate and Mr. Arlán Narváez, who is considered the most important figure in Spanish debate in the Western hemisphere. With these four trophies, FIU Debaters bring international recognition to FIU Debate and help establish Spanish-language debate in South Florida. Stop by the Communication Arts Studio in VH230 to see the new additions to the Debate trophy case and show your support for your fellow Panthers!